Build until your heart’s content with the strength of the Take-Apart Crane Truck! This fantastic, vibrantly coloured Crane Truck will provide toddlers with hours of imaginative fun! 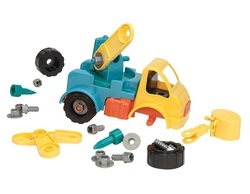 ​Complete with a working battery-powered drill, this toy can be completely dissembled, and then put back together again, presenting an enticing challenge which rewards as the Crane Truck comes to life again. Chunky bolts and interchangeable tools are easy for little hands to work with and once completed, the vehicle is a generous sized, sturdy toy ideal for both indoor and outdoor play. 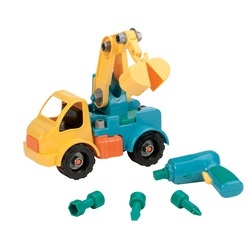 The Take-Apart Crane Truck promotes problem solving and the development of imagination, whilst also encouraging the development of hand-eye coordination.